Singles who are looking for a simple and convenient way to meet new people have found the right place. NaughtyDate is one of the top online dating sites in Canada for flirting and fun, with a casual feel to it, and thousands of matches at the click of a button. Search tools help narrow down the results to singles in the right city, and chatting online means that meeting in person has no awkward silences or time wasted. Women chat for free on NaughtyDate which means there is no shortage of lovely ladies to chat with, and encourages the men to sign up, too! We love the communication tools at NaughtyDate. These include instant chat, webcam chat, chat rooms and SMS messaging, giving singles no excuse not to reach out and meet new people. Users can send a flirt out to multiple members at once. NaughtyDate also offers powerful mobile apps for users who use iOS or Android devices. The activity page is the hub of each members’ interactions on the website, and will show singles who has winked or flirted with them, who has looked at their profile, what friends singles have made, and what messages to look out for. Messages are found in the chat feed, and the Match feed shows specially chosen singles who are the right age and location. The unique features of NaughtyDate include the webcam chat, and the Safe mode for ensuring only verified members can get in touch. It is great to see safety first on an online dating site, and that is what happens at NaughtyDate. Once users have entered their gender, date of birth and email address, the email will need to be verified before they can access the site. Once this is complete, members will be immediately redirected to start filling in their profile. This will be the first impression to other singles and matches, so it is important to take some time to fill it in. 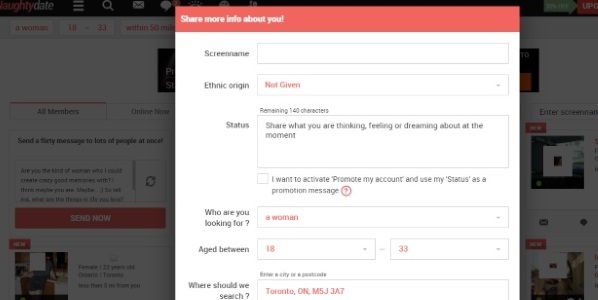 The profile section, which can be edited at any time, is short and sweet, with a screen name, and status, as well as the users’ ethnicity, and what they are looking for. In fact, changing your status and search options often is the best way to attract and find new singles. Using NaughtyDate safely is extremely easy. They offer a ‘Safe Mode’ which allows you to choose who can get in touch, whether that is verified members, or even members who have been awarded a trusted status badge on their profiles. Users can also create block lists with anyone who they do not want to get in touch, and report any problems to admin. There are currently no options for browsing anonymously. There is an extensive safety tips page in the help center which should encourage singles to chat safely online and take all necessary steps to keep themselves protected when meeting someone for the first time from online dating. The pricing is simple to understand and transparent at NaughtyDate. Rather than have multiple types of subscription which unlock certain features, there is one type of subscription that will automatically unlock all the functionality of the site. This includes full communication tools, larger photos, extended search tools and the top level of customer support. Women will be able to chat for free even without subscribing, but they may feel like they want more features than the basic free version, including web cam use and better search tools. The 3-day trial is a great way to try out the website for a short period of time, and costs just $0.99 per day. This is a great alternative to paying for a whole month which will cost $27.99. If you are happy with the trial, 3 months is a good start at $18.99 per month, and it comes with a satisfaction guarantee from NaughtyDate. This means that you can try out one of their other sites free of charge, in case you do not meet someone during the subscription time. Committing to 6 month’s membership makes the site the most cost effective, for only $15.99 per month. Everything about the site is very simple to get to grips with. Sign up is step by step, and if users make any mistakes, these will be pointed out with error boxes. After the sign up helpful popups will encourage users to take the next steps to make the most of using the features available. The left-hand toolbar and the home page has all the areas of the site, and the user's own image in the top right hand corner of the page shows profile and account settings, and how to reach out to staff if more assistance is needed at any time. The basic search on the home page covers gender, age range and location, as well as allowing users to search by profiles with photos and who is currently online. If singles are looking to get more specific, a simple click on the ‘more’ button allows them to search by relationship status, physical appearance, income, body type, religion, education, and lifestyle options such as drinking and smoking. We always recommend that singles try not to narrow it down too much, especially by filters such as physical appearance. You never know who you might find yourself attracted to! A great casual flirting site for singles who want to communicate by webcam and text chat, plus with two mobile apps for iOS and Android. Safe mode makes sure singles are in charge of who gets in touch, and we love the 3-day trial as well as the simple 2 minute sign up.